Ohio University alumna Jeanette Grasselli Brown ’50, a graduate of the College of Arts & Sciences, recently donated her personal papers and her collection of research books to the University Libraries’ Mahn Center for Archives and Special Collections, reports the library. 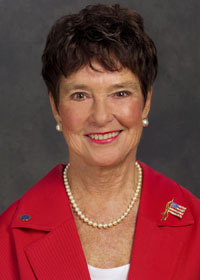 “In addition to her decades of service to Ohio University, including as a member of the University’s Board of Trustees and The Ohio University Foundation Board of Trustees, Grasselli Brown was named Most Outstanding Woman Chemist in the country by the American Chemical Society, has penned nine books in her field, holds a patent, has served on six major corporate boards, and has received thirteen honorary doctoral degrees. Doug McCabe, curator of manuscripts, is currently processing the collection and creating the finding aid that allows researchers to discover the collection. McCabe says the collection will be available early spring semester. University Libraries is proud to steward this collection for future generations of researchers,” according to the library. While an undergraduate student in the College of Arts & Sciences, Grasselli Brown had the opportunity to engage in research with a faculty mentor. In a significant measure, that intellectual experience led to her later professional career as a research chemist with BP, where she became Director of Corporate Research and Analytical Science. A research award in the college, the Jeanette G. Grasselli Brown Undergraduate Research Award, made possible by Grasselli Brown’s generosity, seeks to encourage and facilitate the involvement of undergraduate students in a significant research effort. The Jeanette G. Grasselli Brown Faculty Teaching Award in the college also carries her name.